More pictures of the dress with belt here. So I finally sewed up the little elven dress. It was made out of a men's T shirt, so the edges didn't need finishing. Previous mosts on the making of, here, and here. I'm pretty happy with it, just wish I'd lined the bell sleeves so they drape better. Keziah (13 months in a week) was not happy about being crammed into a 6 month sized baby dress for pictures. 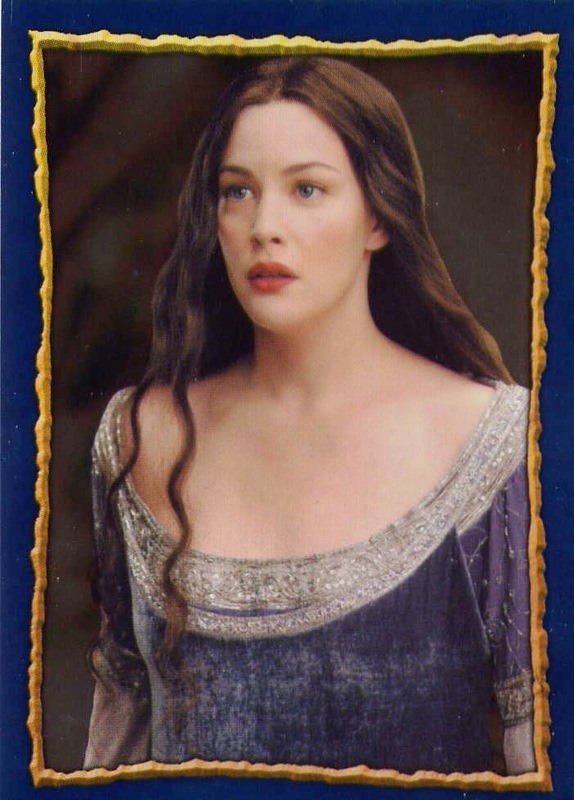 It's ridiculously short (for an elven dress) on her. A PICTURE WITH HER SMILING!!! 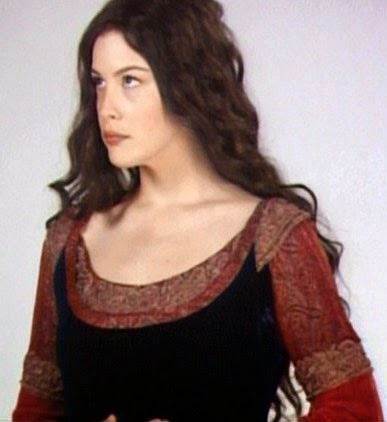 And ofcourse, the Arwen-Inspired nursing dress for myself. And then I got the flu (again?). At least I think that's what it was. I was so sick, I sort of just crawled around with a cold-pack on my forehead, chugging kool aid, begging God that I wouldn't throw up (I didn't!) for 5 days while my mother in law watched the (sick) kids. All in all, I lost over a week, and I didn't even have energy left to look at the sewing machine for a bit. But my strength is returning, slowly. So I had a pattern. That was the first hurdle. Tonight, I just knew I had to cut out the real thing and do it before I psyched myself out. Pretty circular hems on chiffon!! I got through the second hurdle, sewing circular hems on chiffon that are actually pretty. I got the tutorial from this website (which for some reason is having trouble right now? It really had the best tutorial for sewing with chiffon....) Here is my pin with the picture that is important. It's just a simple circular hem, folded over and sewn a second time to enclose raw edges. The key between this and my previous, somewhat sad, circular hems on chiffon, was folding over a fat 1" seam allowance, but sewing close to the edge (like in the picture). The fat seam allowance, ironically, allowed me to trim the seam very close to the stitching, which is what ensures and nice even second seam. I also finished the interior seams in the chiffon, by sewing a thick seam allowance, trimming one side close, and then folding over the other and sewing the edge with a zig zag, also a tutorial on that website. TUTORIAL PICTURE HERE. See my pretty finished interior seams!!! So, now to the third hurdle, sewing the upper and lower sleeves together and onto the jacket. Elven Baby Dress Progress 2: Stenciling the Embellishments. 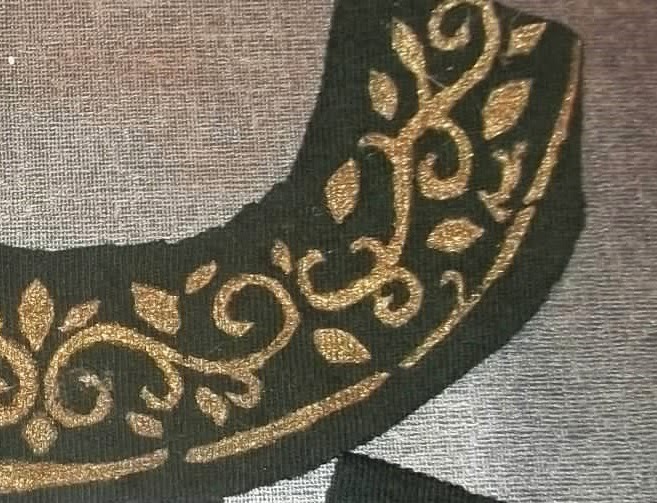 I wanted to embellish the dresses with some vine-leaf motif gold design. Not wanting to spend $$$ on trims that don't wash out mashed-up banana easily (I want to actually put the kids in these on a daily basis and throw 'em in the washing machine), I decided to make my own. Not wanting to spend hours stitching embroidery, I decided to just use fabric paint and stencils. Not wanting to hand cut stencils from freezer paper that I could only use once, I opted to cut the stencils out of stencil blanks. First, I traced my facing pattern pieces, then I freehand drew my designs onto them with a sharpie. Then I cut them out with a utility knife. The stamp blanks are quite sturdy ("Show-Offs" 8x10 value pack, 12 sheets $7, before coupon) and hard to cut. Cutting all those little vine-like curves with enough pressure to get through the plastic, but not enough to slip and ruin the design....and then having to recut them and sorta pull them out with the tip of the utility knife...it's painful. And slow. And my hand was cramping up. And because I am a total idiot stubborn, I decided to cut out a stencil for each yoke size (3-6mos, 12-18 mos, 2-3T). It took me at least good 6 hours adding up all the times I was working on it, I think. I went through 2 blades with 3 neck yokes and 1 section of belt trim. My hand hurt and I was vowing never to do this again. And then I printed the designs (just taped down the stencils with painter's tape, and sponged on Tulip fabric paint with cosmetic wedge sponges from dollar tree). Note: If you want your lines to be "cleaner" (and you can also cut a lot finer lines too) then you should use freezer paper, that you can iron on (just showing how intricate you can get with freezer paper, see how I recreated the Penguins logo on these shirts), or maybe try doing mylar stencils with a spray-on re-positionable stencil adhesive (I think I shall buy some, and review it). 2nd note: USE A SHARP UTILITY BLADE. Cutting with even a slightly dull blade is torture. I used 2 blades (they're double sided) to cut out 4 intricate patterns, so kind of a new sharp edge for each. This adds to your cost, but replacement utility blades are 33 cents a piece, so its really worth it in the end. 3rd note: notice that I broke up the framing lines into sections. If you don't do this, the whole thing kinda puffs up and leaks more when you are sponging on the paint. I learned this the hard way. 4th note: If you want to save your hand some work and some time, perhaps you should try using a stencil cutter. I think I might just go out and buy one now, I will review how it works form me when I do. Baby dress pieces, all cut out. I was working on my next goal for the Small Human Being Sew-along: Elven Baby dress and Elven Baby Tunic. And because my new motto is "mass-production," I decided when making the baby ranger tunic to make a matching tunic for Isaiah (3-4T). And because I noticed it takes me a few times to get it right, I decided to make matching Elven dresses for Jenny(2-3T) and Keziah(12mos) to go along with the baby's one. My resolution to do mass production was when I realized I can get a lot more done for the time sewing, if I sew similar things all at once...the same way I save time on dishes when I wash all the bowls at once, then all the cups, etc. 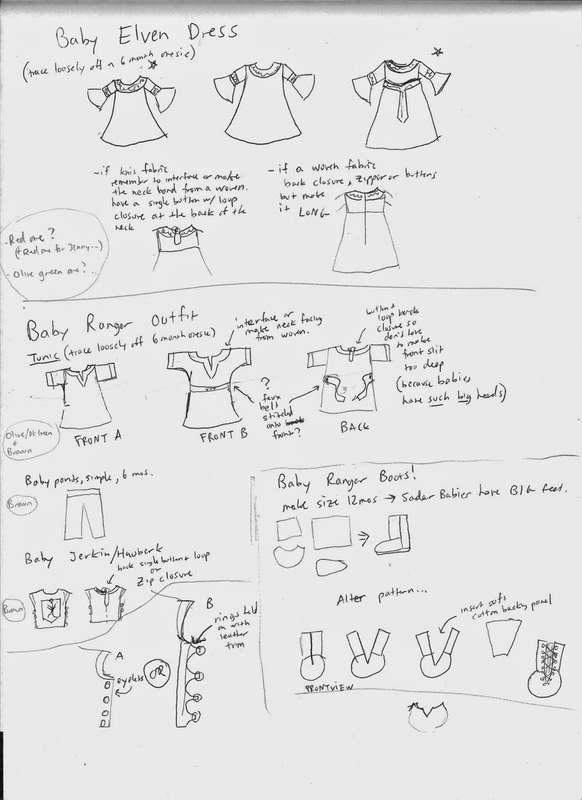 For the baby tunic and dresses, I just traced off a baby onesie (although, after making a dress that only fit a newborn doing this technique, I usually trace generously. Store-bought knit onesies are a lot stretchier than T-shirt knits that I sew from recycled T shirts), and lengthened it to where I thought it Should be. 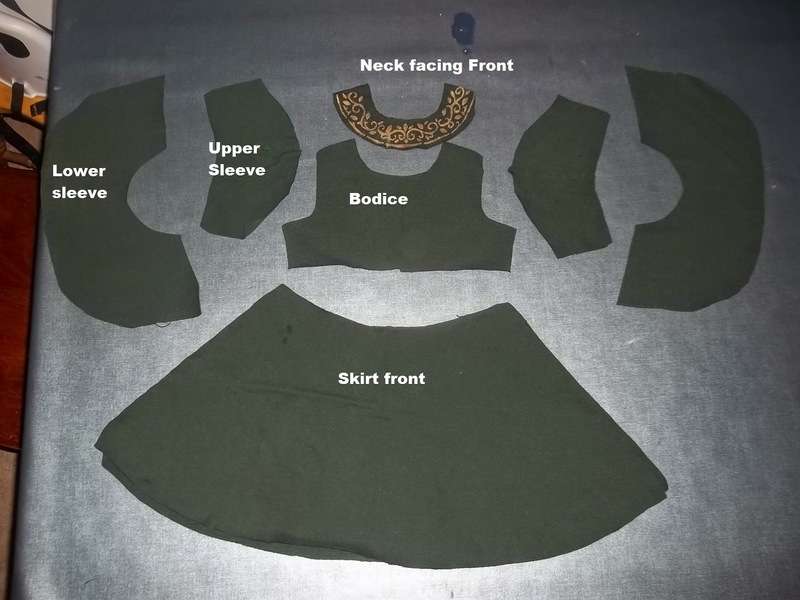 The front pieces of the baby ranger tunic, the thing on the left is the sleeve. 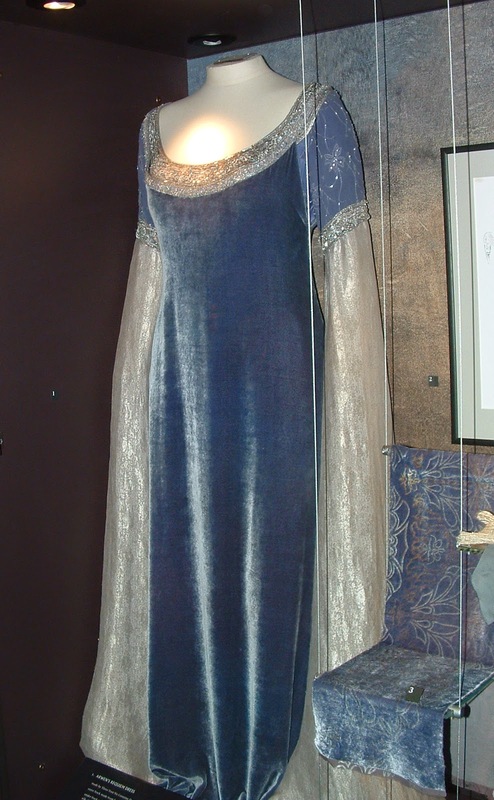 The baby elven dress is sort of self-explanatory here. I tried to just scale this up for the 12mos dress, but found I couldn't make that wide swishy skirt using a single XL tee (wasn't wide enough). So I just traced off the 12mos flared out to the appropriate length. I did the same for the 2T dress, but when holding up the pieces on my (tall) daughter, it just wasn't ankle length...and this dress feels like it should be a "gown" with the bell sleeves and all, so I cut into a 2nd T shirt to sew on 5 more inches for the bottom. Grandma made the cutest cupcakes you ever saw....Jenny calls them "chickee faces." Keziah got a board book she was very excited about. She seems unaware of her great accomplishment. She remains incredibly sweet though, and at odd moments will crawl away from her playing to rest her head on your lap for a few seconds, then catch your eye and smile, before going back to her play. Isaiah's imagination continues to brood on stories, but he at least is letting us be part of it now, as he quotes bits and waits for you to quote back the next line, upon which he continues, and sees how long you can go. His moral development is also coming along, as now, he doesn't just steal fruit when he finds it. Today, I had been washing the grapes, and after purloining some when my back was turned, he came up to me, joyfully holding the grapes, and said "MOMMY, THANKYOU!!!" with the most beatific smile, as he walked off to eat the grapes. He told me a story this morning, as he climbed into a cardboard box that the cats have been enjoying. "Isaiah says, 'Chloe [one of the cats] can I sit in the box?' 'Chloe says, 'yes, Isaiah, thankyou' 'Isaiah says 'You're welcome Chloe!'" Jenny has also been talking a lot recently, she told me a story too. "Jenny was in the backyard, and there was flies. And Daddy came and killed the flies. And Jenny was happy." Jenny continues being the Susie Derkins to Isaiah Calvin. Isaiah burst out with (at dinner) "Are you a dog?" I think, a reference to the David and Goliath video they've been watching recently. Jenny answered. "No. I am not a dog. I am a guwl"
They will give orders as long as I still have a piece of chalk in my hand. These sessions usually end with the apprentice throwing down the chalk and begging the masters to draw their ideas themselves, but they have yet to comply. They also like playing the piano. It actually sounded quite good, with all 3 of them playing. Jenny got her "pink spway bottle" and some cleaning rags, and carried them around. Kuzzles was showing off her mad skills with the walker. Actually, she was quite driven, charging ahead with her little walker, stopping only to smile briefly and then continuing with her mission. She doesn't know how to steer it though, and would inevitably get it stuck on something (trees, chairs, rocks, siblings) and then start to complain loudly until the obstacle was removed. Then would instantly start charging ahead again. I was too tired to really make anything today (well, other than take the kids grocery shopping IN MY GONDOR MEI TAI CARRIER and changing diapers), so I spent up my valuable free time writing this post and looking at pictures. So now, a write up and analysis of all those pictures I've saved to my computer from hours and hours of wasted time on the internet, most of done years ago. 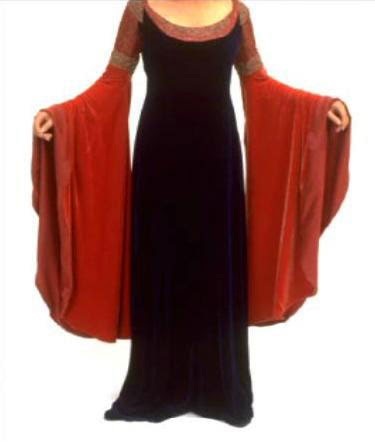 Firstly, the bloodred dress is just a better fitting (to the actress) version of the requiem dress, but in different colors. So I shall refer to them interchangeably.